In preparation of your CCNA exam, we want to make sure we cover the various concepts that we could see on your Cisco CCNA exam. So to assist you, below we will discuss one of the coreCCNA concepts; Dynamic Routing. As you progress through your CCNA exam studies, I am sure with repetition you will find this topic becomes easier. So even though it may be a difficult concept and confusing at first, keep at it as no one said getting your Cisco certification would be easy! An autonomous system (AS) is a group of networks under a common administrative domain. 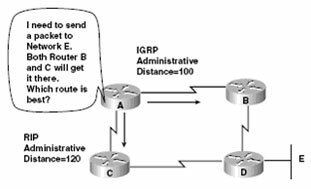 Interior Gateway Protocols (IGPs), such as RIP and IGRP, exchange routing information within an autonomous system. Exterior Gateway Protocols (EGPs) are used to connect autonomous systems. 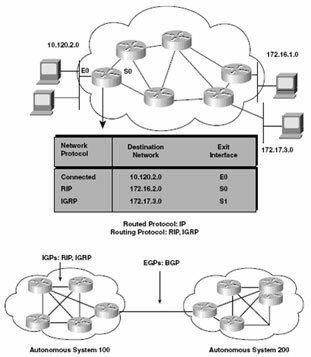 Border Gateway Protocol (BGP) is an example of an EGP. Several routing protocols can be used simultaneously in the same network. When there is more than a single source of routing information, an administrative distance value is used to rate the trustworthiness of each routing information source. The administrative distance metric is an integer from 0 to 255. In general, a route with a lower number is considered more trustworthy and is more likely to be used. Distance vector—Uses the direction (vector) and distance to other routers as metrics. RIP and IGRP are both distance vector protocols. Link state—Also called shortest path first, this protocol re-creates the topology of the entire network. Balanced hybrid—Combines the link-state and distance vector algorithms. Routers using distance vector- based routing share routing table information with each other. This method of updating is called routing by rumor. Each router receives updates from its direct neighbor. In the figure, router B shares information with routers A and C. Router C shares routing information with routers B and D. In this case, the routing information is distance vector metrics (such as number of hops). Each router increments the metrics as they are passed on (incrementing hop count, for example). Distance accumulation is a method that keeps track of the routing distance between any two points in the network, but the routers do not have an exact topology of an internetwork. Network discovery is the process of learning about destinations that are not directly connected. As the network discovery proceeds, routers accumulate metrics and learn the best paths to various destinations. In the figure, each directly connected network has a distance of 0. Router A learns about other networks based on information it receives from Router B. Router A increments the distance metric for any route learned by Router B. For example, router B knows about the networks to which Router C is directly connected. Router B then shares this information with Router A, which increments the distance to these networks by 1. Distance vector routing protocols use routing algorithms to determine the best route. These algorithms generate a metric value for each path through the network. The smaller the metric, the better the path. Metrics can be calculated based on one or more characteristics of a path. Hop count—Number of times a packet goes through a router. Ticks—Delay on a data link using IBM PC clock ticks (approximately 55 ms). Cost—An arbitrary value based on a network administrator-determined value. Usually bandwidth, cost in dollars, or time. Delay—Time required to reach the destination. Reliability—Bit error rate of each network link. MTU (maximum transmission unit)—The maximum message length allowed on the path. [SPF]) maintains a database of topology information. Unlike the distance vector algorithm, link-state routing maintains full knowledge of distant routers and how they interconnect. Link state sends only topology changes. Distance vector sends complete routing tables. Link-state updates are sent less often than distance vector. Link state is hierarchical, which limits the scope of route changes. Link state supports classless addressing and summarization. Balanced hybrid routing combines aspects of both distance vector and link-state protocols. Balanced hybrid routing uses distance vector with more accurate metrics, but unlike distance vector routing protocols, it updates only when there is a topology change. Balanced hybrid routing provides faster convergence while limiting the use of resources such as bandwidth, memory, and processor overhead. The Cisco EIGRP is an example of a balanced hybrid protocol. Routing protocols use the network layer address to forward packets to the destination network. An AS is a collection of networks under a common administrative domain. More than one routing protocol can be used at the same time. Administrative distance is used to rate the trustworthiness of each information source. Distance vector, link state, and balanced hybrid are the most common IGPs. Distance vector-based algorithms send copies of routing tables. As network discovery proceeds, routers accumulate metric information used to determine the best path to distant networks. 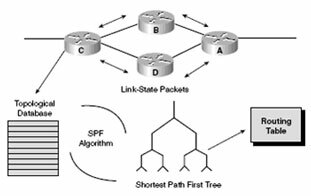 A link-state routing algorithm, also known as SPF, sends network topology information rather than metrics. Balanced hybrid routing combines aspects of both distance-vector and link state protocols.